Occupy Nashville hasn't had a ton of media coverage like some of the other cities, and even if it was you really can't be sure you're getting the full picture without seeing it for yourself, so I drove downtown this afternoon to see what it's all about. The last big story I saw was from last month when Gov. Bill Haslam enacted a new curfew and sent the police in at 3am that very night to arrest the protesters. The night court commissioner surprised police by refusing to sign the warrants for arrest. Since then, a federal judge has ruled that the state could not enforce the new curfew and Haslam has asked to drop the charges. So where does this leave the protest? When I drove up I saw many tents set up, but few people. By the time I got parked an made my way to Legislative Plaza, I saw a small group with signs posing for photos. One of the protesters who was not in the group informed me that they were on their way to picket bank offices and excitedly explained that yesterday they forced Bank of America to close down. 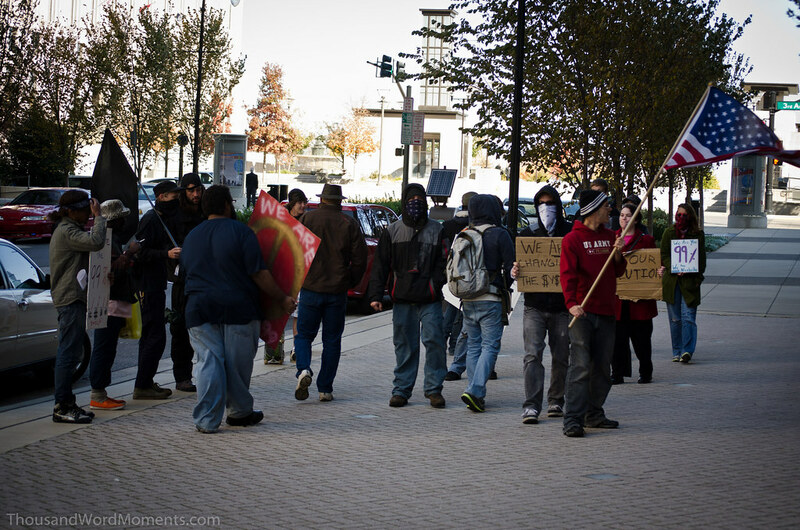 Rather than walk around a mostly empty camp I followed the group and caught up with them as they marched in front of the Regions Bank building chanting, "Hey hey, ho ho, corporate greed has got to go." It's not every day you see a protest so I snapped some photos. I guess I just figured they would ignore me or possibly pose since protests thrive on attention, however I did not expect the stares of suspicion and one college age protester to stand in front of me with his camera phone taking my photo. I had my photos and, as no police were showing up, I didn't expect anything to happen worth shooting so I put my camera away and followed them as they marched around the corner. One of the protestors had a laptop rigged in a harness with a webcam and cell phone. I can only assume he was broadcasting a live stream of the protest and he kept reminding everyone that they needed to stay on the sidewalk. While I stood by and watched the picketing he walked over and pointed the laptop rig in my direction. I thought this might be where he introduced himself, shared some information about the cause, or started asking me questions, but after a moment he turned and went back to the group. In fact, during my entire time watching the protest nobody said a thing to me or gave me a second glance unless it was one of suspicion. Between this and the fact that many of the protesters were wearing bandannas over their faces I felt very little kinship or solidarity with a group I thought would share many of my views. I agree with most of the points made by the occupy Wall Street movement and would most likely be very sympathetic to the cause of occupy Nashville...if I were able to figure out exactly what that cause was. What is this group demanding? I heard a lot of complaints about corporate greed and bailouts, but what do they expect our local government do about it? I don't often agree with the mainstream media, but it does seem that the "occupy" movement lacks a coherent message when you can spend thirty minutes watching them and still don't know what they want. Please, if you are involved in this movement, take this opportunity to comment and enlighten me. If you are afraid to reveal your identity to the public then send me a private email and I'll amend this post with your response. I certainly don't want to take away from your efforts and I applaud those who are willing to put themselves on the line for what they believe. We just need a bit more clarification or else all we'll see is a bunch of angsty college students wearing bandannas, carrying skateboards and flags, chanting rhymes about how unfair things are. Thanks for capturing your experience. I think the American people supported the original message, but it seems that as the weeks have gone by, that message (to deal with Corporate Greed and Political special interests) has gotten lost in the rapes, drug abuse, vandalism, being reported by the media in the camps. And the movement seems content in allowing these acts to continue. I also believe that America is starting to turn on the movement because of this. And the organizers don't realize that we are part of that 99% also.